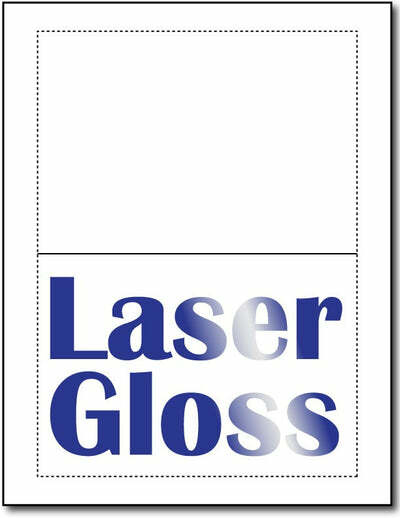 Laser Gloss 5" x 7 Foldover Greeting Cards make it easy to print to the edge! Simply create a 5" x 7" card (7" x 10" unfolded) in your publishing program, center it to an 8 1/2" x 11" paper, and print. The actual card measures 4 7/8" x 6 7/8", leaving you 1/8" border for your card's bleed. 5" x 7" Print to the edge Greeting Cards are made from an 80lb Cover (216 gsm) laser glossy cardstock. Glossy on one side, matte on the back. Both sides are printable. Laser Printer compatible only! This card is perforated for easy breaking and scored for easy folding! Created on an 8 1/2" x 11" sheet. Actual measurements are 9 3/4" x 6 7/8" unfolded, 4 7/8" x 6 7/8" folded.